The 2018 Chevrolet Corvette Z06 Convertible comes with a 650 hp, 650 lb-ft 6.2-liter supercharged sledgehammer that tortures the rear tires through either a rev-matching 7-speed manual or available 8-speed automatic transmission. Acceleration and handling are class-leading and the ride remains good on bumpy roads too. Standard specification levels are comprehensive and adaptive dampers and a Bose audio system are available even on the base 1LZ Trim. Move up a trim or two and heated and ventilated seats, navigation and curb view cameras are also available. For those wanting the ultimate convertible Corvette, the Z07 Performance Package offers magnetic selective ride control, Carbon-ceramic brakes and sticky summer-only tires. The Chevrolet Corvette has been an integral part of American performance motoring for decades and in Z06 form it raises its game to new heights. It offers tire-shredding straight-line pace with handling that beats just about every similarly priced competitor and challenges some far more expensive sports cars too. The Convertible Z06 allows you to experience that main V8 in all its glory and for 2018 some minor changes and updates have been carried out to keep the Z06 at the front of the pack. You sink low into the comfortable seats of the Z06, a large transmission tunnel separates the two occupants and there are plenty of soft touch plastics and leather covered surfaces to impart a suitable feeling of luxury. 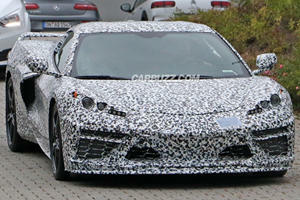 In general, the fit and finish on certain rivals may be better resolved but at this price level none will match the Corvettes dynamic abilities. Storage space is limited to a few small bins and pockets in the cabin and the small trunk is also mostly occupied by the top when it is down. But let’s forget about the lack of storage space and compromised two-seating layout, this is a sporty convertible after all. 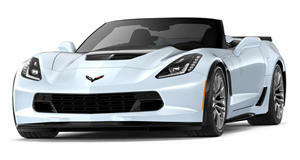 In Z06 form this Corvette provides a driving experience that leaves its natural price rivals flailing in its wake. Grip levels approach supercar levels and its handling ability and steering feel on challenging mountain passes is out of the top drawer too. Roof down you are bathed in a glorious V8 wail as you race through the gears, when taking it easy the engine remains a background burble, the ride becomes supple and other than some tire noise on coarse surfaces the Z06 Convertible is a consummate cruiser. 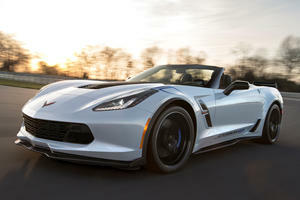 Powered by a 6.2-liter supercharged V8, the Z06 is not exactly short on power. Peak outputs of 650 horsepower and 650 lb-ft of torque are class-leading and nothing at this price will match it to 60 mph, which Chevrolet claim to be a very specific 2.95-seconds. That is when equipped with the 8-speed automatic transmission, the standard 7-speed manual may be a fraction slower but is possibly even more enjoyable. Fuel consumption is a claimed 15mpg in the city and 22mpg on the highway. There are three trim levels to choose from, 1LZ, 2LZ and 3LZ. The base 1LZ comes packed with a large number of standard features, notable items include 19-inch alloy wheels, adaptive dampers, performance exhaust, Brembo performance brakes, HID headlamps, Bose 9-speaker audio system, 8-inch touchscreen infotainment system, 8-way power seats and leather-wrapped steering wheel. Cruise Control a head-up display, Wi-Fi hotspot, keyless entry and a rearview camera also form part of the standard equipment list. The 2LZ Trim adds an upgraded 10-speaker Bose audio system, auto-dimming rearview mirror, heated and ventilated seats and curb view cameras. 3LZ Trim includes the above and adds navigation, performance data recorder, custom leather-wrapped interior and a sueded microfiber-wrapped upper trim package. A unique option reserved for the 3LZ is the Carbon 65 Edition Package. This includes staggered 19/20-inch alloy wheels, competition bucket seats, blue custom leather stitching and numerous interior and exterior carbon-fiber ascents and finishes. A Z07 Performance Package adds Z07 suspension with magnetic selective ride control, Carbon-ceramic brakes, Michelin Sport Cup 2 summer-only tires and detail changes to the spoiler and front splitter. The Chevrolet Corvette Z06 Convertible puts in such a dominant showing that worthy rivals are in short supply, German sport coupes may be better built but can’t match it on the road. Italian exotics are more of a dynamic match but cost up to three times as much. 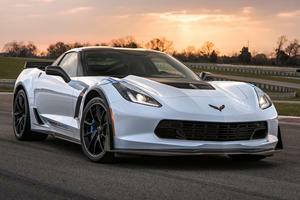 Its nearest competitor is found much closer to home, in the shape of the cheaper Z06 Coupe. It offers the same 650 hp adrenalin rush and superb handling dynamics and has a removable hardtop that provides some of the convertibles open air experience without compromising on trunk space. Your choice. A leaked document reveals some interesting information. We've been expecting this news from some time now.